Malaysia | What is Dr Mahathir really fighting for? The redoubtable Dr Mahathir is once again on the warpath. In recent months, he has fired salvo after salvo of withering criticism against Prime Minister Najib Tun Razak accusing Najib of a whole array of sins – mismanaging the economy, squandering billions, living lavishly, mishandling the Altantuya murder investigation, not being a strong leader, burdening the people with GST, kowtowing to the US on TPPA, etc. He has even levelled against Najib what is perhaps the ultimate insult in his lexicon – being worse than Pak Lah! His attacks on Najib have, of course, thrilled the hearts of the legions of Malaysians who are fed up with Najib’s leadership. Indeed, many now look to Dr Mahathir as the would-be saviour of the nation. Even the equally redoubtable Lim Kit Siang has offered to work with him to save the nation. If anybody can succeed against Najib, it is, of course, Dr Mahathir. He alone has the stature, the authority, the political smarts and, of course, the impunity, to go head to head with the PM. There is none more implacable, more skilful, more determined than he. He also has the experience, having brought down a sitting PM before. When the doctor gets his political scalpel out, somebody is most likely to get scalped. Is he fighting for the restoration of our freedom and democracy? Is he fighting to repeal unjust laws like the Sedition Act which is being used to harass, intimidate and incarcerate government critics? No, he actually doesn’t think much of democracy and considers freedom vastly overrated. He favours censorship of the media, supports the use of the Sedition Act and has called for the reintroduction of the ISA. His governance philosophy tends to favour almost untrammelled powers for the executive – especially if they stick to his script. Is he fighting for better economic management of the nation, an end to corruption and crony capitalism? No sign of that either. Malaysia continues to slide into an abyss of unimaginable corruption with billions upon billions being siphoned off and squirreled abroad. We have careened from one scandal to another with no end in sight. A recent survey found we are the most corrupt nation in the region. Another survey ranked Malaysia number 5 in the world in terms of the illicit outflow of capital – more than RM171 billion in 2012 alone. None of these things have earned the ire of the doctor. His criticism of Najib over the 1MDB scandal, as deserving as it certainly is, does not appear to spring from any intrinsic distaste of corruption or crony capitalism; it is merely another convenient nail to drive into the PM’s coffin. After all, the culture of crony capitalism and corruption became etched in the national fabric during his administration; 1MDB is simply the chickens coming home to roost. Is he fighting for the rejuvenation of our national institutions – the justice system, the civil service, law enforcement – which are all in crisis today? Again, unfortunately, he is no reformer. Even his criticism of the way the Altantuya murder was handled smacks of opportunism rather than a deep-seated concern about a grave injustice. If a cover-up has indeed been perpetrated, as many now believe, then surely the entire justice system deserves to be condemned and completely overhauled. But again, this is not what he is calling for. Is he fighting to enhance national unity and improve racial and religious harmony which is a pressing national concern? Unfortunately, the answer is again no. There was a time when he thrilled Malaysians with his vision of “Bangsa Malaysia” and held out the hope that, finally, we might be able to exorcize the twin demons of racial and religious division that have so impeded our progress, but that is just a bad joke now. Instead, he continues to make outrageous remarks against minorities and finds common cause with extremists. It was not by chance that he turned up at a recent rally with two of the nation’s most polarizing figures. Judging from his own statements, the inescapable conclusion is that he is not fighting to bring down a corrupt and abusive system; he merely wants a more competent, and perhaps malleable, manager to ensure the long-term survivability of a regime that is in crisis, that doesn’t deserve to survive, that has wrecked so much havoc upon the nation, that the majority of Malaysians have already rejected in the last general election. And, of course, as he himself mentioned on more than one occasion, he is fighting to postpone the day of reckoning for all the corruption and abuse of power that has flourished for so many decades. If Najib deserves to be condemned for his abuse of power and mismanagement, then so too do all the others. Dr Mahathir’s campaign against Najib is thus an unholy war that has more to do with self-interest than with national interest. It is a struggle to preserve and consolidate a politically and morally bankrupt regime. It is an unprincipled quest with unprincipled partners for unprincipled ends. There is no doubt that Najib must go – not in the interest of preserving the status quo but that real change can come. As it now stands, if Dr Mahathir succeeds, we lose; if he fails we still lose. 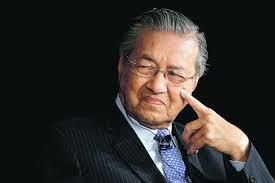 Of course, there is no doubt that Dr Mahathir is an outstanding leader. His ability to inspire people, his unlimited ambition for Malaysia, his talent for wielding the often cumbersome machinery of state in pursuit of national objectives were always impressive. If only he had marshalled all that for the good of our nation, what a legacy he would have left behind, what a great nation we would have become. During the course of my long career as a diplomat, I had many occasions to work with Dr Mahathir and I have to say that I still treasure those times. He was always gentle, kind, courteous, an honour to work with. Some of my proudest moments came when I stood beside him on the international stage and saw the respect our nation commanded. I dare say that most of us would have followed him to hell if necessary, and we did; too bad he insists on keeping us there. Dennis Ignatius was Malaysia’s ambassador to Chile & Argentina and High Commissioner to Canada.